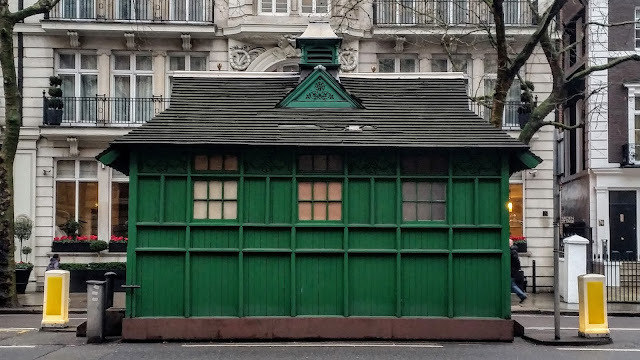 I had spotted a few of these little green shelters, on my various jaunts through the Unfinished City, and had always wondered what they were for. I knew they were used by taxi drivers, but that was all. Built between 1875 and 1914, these green Cabmen Shelters, of which 61 were built, appeared on the streets of London. They were in response for a need for cabmen to have a place to eat as, by law, they were not allowed to leave a cab stand, while their cab was parked there. If they went elsewhere for something to eat, they had to pay someone to watch the cab while they went inside. Because the shelters were built on the public highway they could be no bigger than a horse and cart. Each shelter normally had a small kitchen and a table and chairs, enough to seat about thirteen people. If the cabmen were lucky, an attendant would sell food and non-alcoholic drinks to the various cabbie's. Gambling, drinking and swearing were strictly prohibited, in the shelters. Although the general public are not allowed inside the shelters, except on Heritage Open Days, if you are lucky, you can still purchase a cup of tea or coffee, from the window. Only 13 shelters, of the 61 built, are still in existence and all of them are Grade II listed.